This is the EASIEST and TASTIEST Loaded Baked Potato Soup! 30 minutes is all you need to get a creamy, comforting, and healthy soup on the table. This potato soup is one of the creamiest I have ever had, but yet it contains no butter and less cheese than most recipes call for. It is the perfect recipe for cold, busy nights! 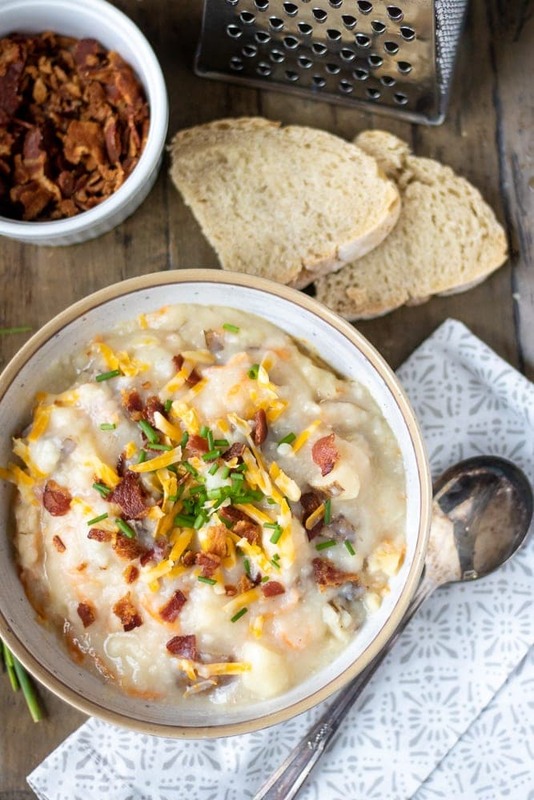 For more comforting soup recipes, check out Panera Broccoli Cheese Soup, Instant Pot Zuppa Toscana, Slow Cooker Minestrone Soup, and Lasagna Soup. There are recipes that are near and dear to my heart. This Baked Potato Soup is one of them for me. Not only because it is delicious, but it reminds me of a dear friend I lost several years ago. Many years ago, I spent a couple of days a week volunteering with some fabulous women at my church. We spent hours cutting out circles and counting craft sticks for the Preschool Ministry. And while we cut and counted away, we developed such close friendships. We worked away while we shared our parenting struggles, our frustrations, and our hearts. One of these precious friends was battling her 3rd round of cancer. And this Baked Potato Soup was her favorite. Sadly, she lost her fight with cancer a few years later and whenever I make this soup, I smile at her memory and say a prayer for her sweet children who miss her dearly. Loaded Potato Soup is simple and easy, but it hits the spot every time. And is made in one pot in just 30 minutes. As creamy and decadent tasting as this hearty soup tastes, it is actually quite low in fat and calories–especially compared to Baked Potato Soups you get out like Panera’s Baked Potato Soup. Easy Baked Potato Soup is so easy to make, I tend to think of it as humble. But yet the flavors in this simple soup are perfect! Scrub and dry russet potatoes. I do not peel the potatoes, if you would prefer a creamier soup, feel free to peel. Chop potatoes into 1 inch cubes. Place potatoes in large stock pan. Add minced onions and carrots. If you have picky eater, omit the minced onions and carrots and add in 1 teaspoon onion powder. Pour in chicken or vegetable stock and vinegar. Bring soup to a rolling boil. Reduce heat to a simmer, cover and simmer for 15 minutes, or until potatoes are fork tender. To thicken potato soup and make this soup creamy, I add in a milk and flour mixture to the soup. Whisk together milk with flour until well combined. Once potatoes are fork tender, remove soup from heat and whisk in milk mixture. Return to heat and turn heat to high and whisk and cook for about 3-5 minutes, or until creamy and bubbly. 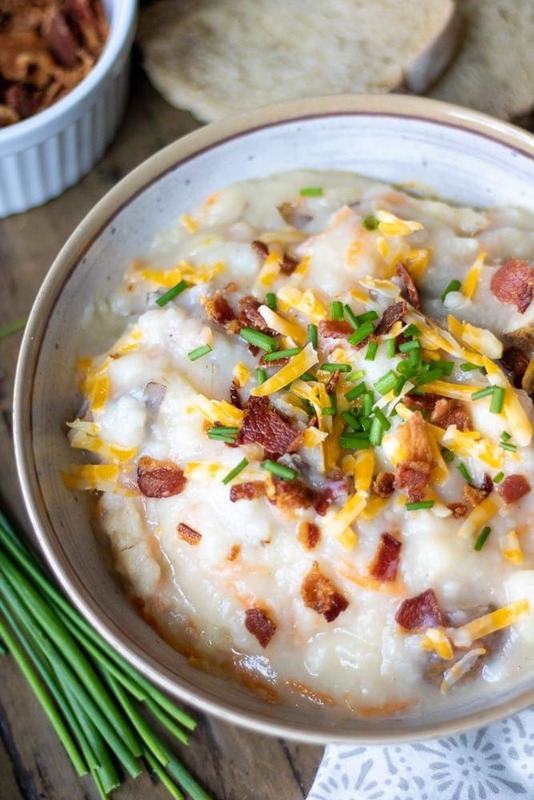 Dish out potato soup into bowls and serve with shredded cheese, crispy bacon, and chives. Do not omit the vinegar in this soup or substitute white vinegar for another vinegar. That is the MAGIC ingredient in this soup–it add flavors and helps preserve the texture of the potatoes. I do not peel my potatoes for this soup because so many nutrients are packed in the skin. Do whatever your family prefers. If your kids will turn their noses up at carrots or onions, omit them (I do this many times with great success). Use vegetable stock to keep this soup Vegetarian. If you need this soup to be Gluten-Free, use a 1:1 Gluten Free Flour Mix. Top with bacon, cheese, green onion or serve as is–it is delicious plain. In only 30 minutes, a hearty, low-fat baked potato soup comes together in one pan. Place potatoes, chicken stock, vinegar, salt, carrots, and onions into large pan. Bring to a boil and reduce heat and cover, reduce heat to medium and cook for 20 minutes. Remove soup from heat and whisk in milk mixture. Return to heat and turn heat to high and whisk and cook for about 3-5 minutes, or until creamy and bubbly. Serve with shredded cheese and bacon crumbles as desired. I’ve somehow not made baked potato soup before but this looks great, very comforting and filling for colder days. Oh my goodness Caroline, you must remedy this ASAP and make this soup! You will love it! Baked Potato Soup has to be one of my absolute favorite types of soup -it’s always good no matter what time of day. You’ve made me hungry now and I just ate! You will LOVE LOVE this version Sarah! Kristen, that was so sweet of you to have provided your friend with some comfort during her battle and I am so sorry to hear of her outome. By the way, I adore potatoes and this “humble” soup sounds so incredibly comforting. Thanks Shashi, it is incredibly comforting. I love when food brings back such strong memories and as a Children’s Minister, thank you for the work that you did to support the little ones and teachers in your church! This soup sounds marvelous on a frigid winter day! Potatoes are so comforting aren’t they. I love that you made this healthier. Can’t wait to try it. I pinned this one for later! I can’t wait to try this on a cold snow day… like every day in January and February here. I hear ya!! It has been cold here in NC too! Every soup I make, I add a pop of flavor like vinegar or lemon juice. For that reason I bet this soup is amazing. Just perfect for cold winter meals. I want some of this soup! Delish! I pass you over a bowl! This looks incredible! I love this soup because it’s so comforting and because it reminds you of your dear friend. What a wonderful tribute to her! I make a really creamy version of a potato and bacon soup but I like the idea of this one to add lighter variation the routine. I love quick and easy soups like this, it sounds delicious, perfect for this cold winter weather we’re having right now! Joy–this soup is perfect for cold weather!! Sometimes the most special recipes are the ones that carry memories like this — regardless of how simple or complicated they are. Thanks for sharing this special recipe. Looks delicious. Isn’t that the truth–memories often make simple food spectacular!! Gorgeous soup Kristen. I love using potatoes as a staple in soups. They go a long way, are filling and nutritious. This looks like a soup we’d all love to dip our spoon into! Sorry to hear of the loss of your friend, trust she is in a better place now with no more pain. I love that this is chunky and not all smoothed out like most potato soups. Winner!!!! Michelle, I am totally with you–chunky soups are so much better than smooth. It’s easy to see why this is a longtime favorite and these pictures are really stunning! Just want you to know when you say “crumbled bacon as desired” I hear “all the crumbled bacon in the land.” Thanks for bringing this yummy soup to Saucy Saturdays. I added 1/2 stick of butter and a dash of pepper – its delicious! I love an easy soup and this one looks great! I’m gonna make this, but sub the milk for almond milk. We love baked potato soup!!!!! My daughter’s fave! Then this is the soup for you! Such a hearty bowl of comfort! I love that it’s a 30 minute meal! I love 30 minute meals as well! I’ve never done potato soup before. Yours look fabulous and so easy to make, perfect for this blommy day. Oh my gooness Wanda, you need to try this recipe. So easy and so comforting! Thank you for sharing. I made this for dinner tonight. It was great and filling on a cold Colorado night. This soup sounds lovely 😊. Can you make it in an Instant Pot? Soooo good and very easy to make! The only thing I did differently was to add a couple cloves of minced garlic. Thanks for a recipe that I will make again and again!